To combat congestion, Luxembourg aims to become the first country to implement fare-free public transit services. Other European nations are considering similar courses, but across the pond the United States continues to fumble its public transportation to deleterious effects. Luxembourg’s goal is noble, but it will have to overcome historic trends showing such fare-free systems rarely work in the long run. In our popular consciousness, public transportation dredges up images of graffiti, sullen-eyed workers, and urban riffraff. See, for example, every movie to ever feature a scene on a bus. Meanwhile, private transportation enjoys glowing fulsome marketing and even vehicle names—think Fiesta, Sonata, Forester, and Mustang—elicit feelings of wealth, class, and freedom. This tendency leaves our popular consciousness blind to the many benefits of public transit. According to the American Public Transportation Association (APTA), public transportation yields $4 of economic return for every dollar invested. It increases business sales by helping workers get to work and customers get to stores. And it can help curb greenhouse gas emissions. In the United States alone, public transportation saves 4.2 billion gallons of gas annually. Such benefits flow to individual households, too. For every dollar earned, notes the APTA, the average American household spends 18 cents on transportation, most of which goes to operating and maintaining a vehicle. Using public transit and having one fewer car, families could save as much as $10,000 a year. Looking to augment these benefits, Luxembourg has decided to be the first country to lift all fares on trains, trams, and buses. A Luxembourg train passes over a bridge. 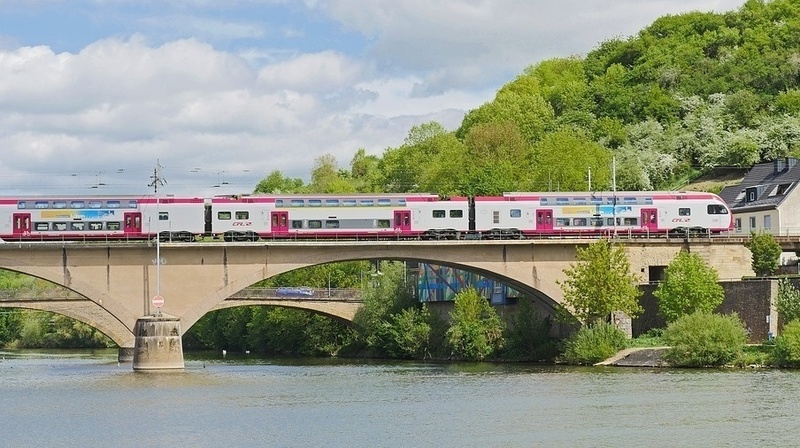 Luxembourg will offer free fares on public transportation next summer. The change will be implemented as part of Prime Minister Xavier Bettel’s progressive and environmentally friendly platform, which he and his Democratic party ran on in the previous election. In addition to limiting greenhouse gases, the fare-free policy also hopes to ease the country’s incredibly high congestion rate. Luxembourg sports 647 cars for every 1,000 people, and residents currently spend an average of 32.21 hours a year in traffic jams—great for getting through your audiobook collection but not much else. Nor is such a move completely out of the blue. As Guardian contributor Daniel Boffey points out, Luxembourg’s public transit is already heavily subsidized and the fare-free system is just another step in its increasingly “progressive attitude to transport.” This summer, the government offered free rides to people under 20, as well as free shuttles for secondary school students. On average, commuters pay €2 for up to two hours of travel. In a country half the size of Delaware, that goes a long way. Luxembourg also hopes that running costs will be reduced by removing the need to collect and process fares. But there are some issues remaining, such as figuring out how to prevent free-riding sleepers and urging those with means to reduce their car usage (i.e., the tragedy of the commons).